I bring a Valentine's Day nail look to you today. I honestly meant to have this post up yesterday, but, some times things just don't work out the way we have planned them! With that being said.. My "plan" for the next couple of days (up until Valentine's Day) are to post up some Valentine's Day themed nails.. I mean, why not, right?! This first "look" is super simple. 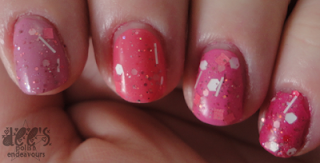 I picked out a wealth of pink nail polish and topped with some glitter. Genius! Basically, my idea to inspire those of you looking for inspiration: take some pink polish, and top it off with a glitter - can be pink glitter, can be any kind. Just something girly, and fun! Have an awesome day everyone, and I will see you again soon! The top coat is adorable, especially on your thumb! perfect!! 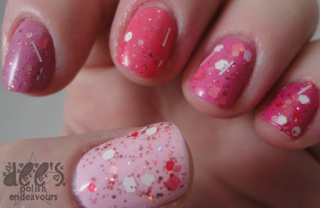 love pink and glitter!!! great combo!